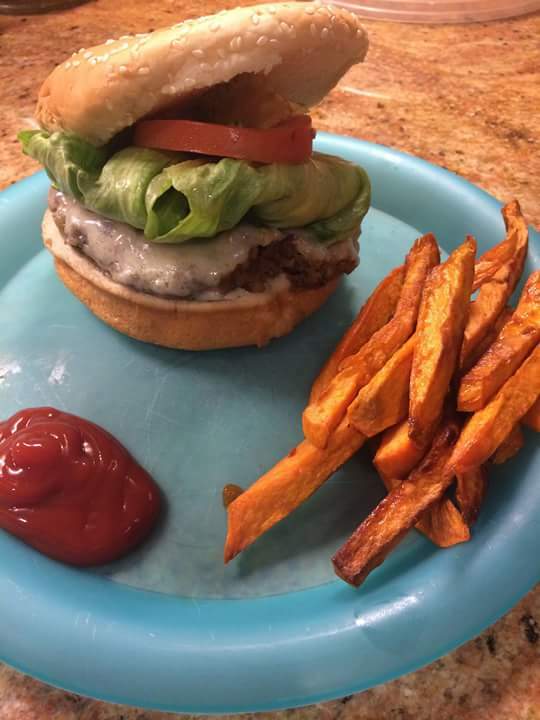 Home / Recipe / Veggie burger with sweet potatoes fries! Veggie burger with sweet potatoes fries! This was a success the last time I made this so decided to make it again except this time I added barley and spinach. If my kids only knew what's inside. But they ate it all! It's actually very simple. I boiled lentils, barley in one pot and in another pot black beans. Then when it was all cooked I put it all in one bowl. Then in the food processor I put onions, spinach, red bell pepper. I through that in the bowl together with the beans, lentils and barely. Then I added one egg in there with bread crumbs with salt, paprika, cumin, Marak of, turmeric. Mixed it altogether. Then made hamburger patties and cooked over medium heat. Forgot to mention I flatted the beans with a fork. For the sweet potatoes I sliced them and then fried them and added very little salt. On my burger I melted cheese which tasted even better. Enjoy! You can eat it as a wrap without the bun, which is good too.